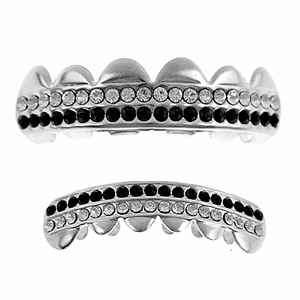 Best Grillz™ 2 row top and lower grillz set. Silver tone rhodium plated over brass metal. Two silicone molding bars and instructions. FDA approved (21 CFR 175,300) silicone. Nickel and lead-free, safe to wear in mouth. Dazzling black row and clear row of stones. Quick and easy to fit in about five minutes. Grillz are designed to fit most adult teeth. Real looking bling grillz set made in Korea.